Publicity can be tough. It's also a really delicate ecosystem with obstacles and folks that could (and should) be helping you throughout your career. During my years working with artists on their publicity campaigns, I've found one particular relationship that can be surprisingly complex, despite what you'd expect. That relationship is the one between the artist and the venue. The strategy and partnership between the venue and artist should be symbiotic, right? Venues should be the peanut butter to the artists' jelly, the milk to their cookies, the Patrick to their Spongebob... okay, you get the picture. Despite the obviousness, I often have to urge my clients and their managers to lay out marketing responsibilities when booking a show or tour. Very often, the booking and marketing team at a venue assumes the artist's team is handling certain tasks, and often, the artist assumes the venue will be handling certain tasks. Even if the venue has a dead-on marketing routine, having the discussion will also cut back on unnecessary efforts from either side. Below are four marketing and publicity essentials and what roles belong to whom, so you can organize your next campaign seamlessly. Community calendars are tricky, because while they often belong to a local newspaper or magazine, some are their own entity. Which would make them kind of easy to skim over when making a media list for your show announcements – especially if you aren't familiar with the area in which you're performing. But it doesn't hurt to run your media list suggestions by them. Not only is this safe, but it also shows the venue that you're taking a proactive effort in selling seats, which looks very professional on your part and makes a great impression with the venue staff. It may be better for the venue to handle an outlet like a local community calendar, as they'll likely have a better grasp on their market. The same can be said for a local media list, but in my experience there may be some that you've thought of yourself, or they don't have time to handle. Also, presenting a venue with a media list and your strategy often makes you a great candidate for another invite (if your show does well). I've moved around a few times in my career. For instance, I attended college in Mississippi, and like most, I moved away for work after graduation. Despite moving many years ago, however, to this day I still get these pesky Facebook invitations from bands to attend shows in my old college town. And I get them, like, a lot. A lot of acts just go in and invite all of their Facebook friends to a show, despite geographic location. So when it comes to social media invitations, who should handle it? Think about it: the venue (typically) has a geographically specific social media presence. Leave generating Facebook events up to them. You as a band can still rely on efforts through geo-targeted Facebook posts, or graphic banners with tour dates – even Bandsintown or similar apps. The Facebook event invitation is also getting a bit antiquated, namely for the spam factor I mentioned above, but it serves its purpose. Let the venue have it. If you haven't noticed, Facebook's ever-evolving algorithm is tough. It relies heavily on interaction, and if your post aren't liked, commented on, or shared, they're not going to be visible to your fans, even if they've "liked" your page. One way to get around this is to boost your post by putting a few media dollars behind it. So, who would fare better in this situation? It's very smart for venues to have this in their marketing plans, as I've seen it increase attendance numbers extremely well. But it doesn't hurt for the artist to do this as well. It's as simple as making a graphic or even a text post, geo-targeting it to the relevant city, and then boosting it. Even $10 or $20 helps reach the folks in your target area. A lot of local venues (and some labels) still rely on street teams for displaying banners and posters around town. But who handles 'em? Are they worth it? They surely are worth it, especially in college towns. Another medium is online graphics announcing the show – that's just as good a route. While posters are cool, they aren't always necessary. Having a cool graphic shared online is just as good. I recommend the artist handle branding as they can best create a graphic or poster that fits the tone of their music. The venue could very well create a graphic or piece that cheapens your brand, or doesn't represent you well. At the very most, if it's in your budget, have some posters made and send them to the venue. Also, have some graphics made for online use. At the very least, send the venue the files so they can post on their social media channels. These are just a few quick tips and tricks to work with a venue for optimum success. 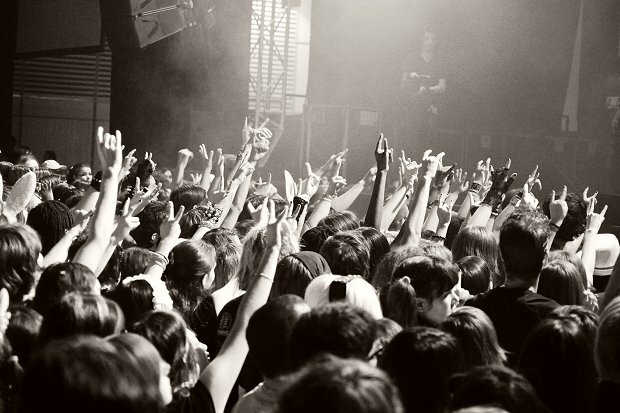 Remember to always follow up with reporters, the venue staff, and your fans and thank them for a successful show!